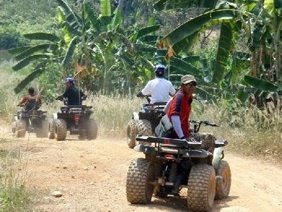 Explore the jungle on this guided ATV quad-­‐bike adventure. Witness 1000 year old Mayan ruins and local flora and fauna as you travel through the heart of the dense tropical forest. 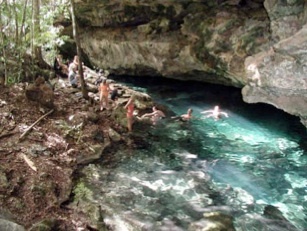 A stop for a refreshing swim and snorkel at our crystal clear cenote is a highlight of this tour. Back upon the ATVs, the next destination is an underground cavern, complete with stalactites, stalagmites, sacrificial altar and bats. Snorkel equipment and soft drink/water is included. This 2 hour tour operates daily at 9:00 am, 11:00 am, 1:00 pm or 3:00 pm. Snorkel equipment included. 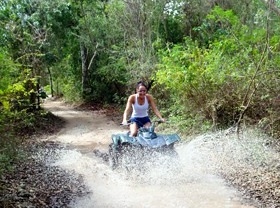 Put some adventure into your Mayan Riviera vacation with our ATV tours. 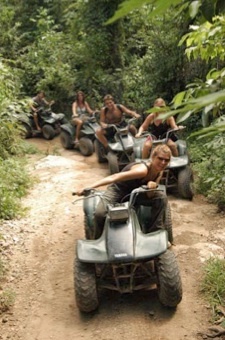 Hop onto one of our well-maintained ATV’s and take a tour through the wild Mexico Jungle. During this 2 hour tour you will get an overall impression of all the beauty and adventure that the Yucatan Peninsula has to offer. We meet up at our coast-side location south of Playa del Carmen. The tour starts with a briefing on the features of your ATV and on the general safety rules. Then we’re off for two hours of non-stop fun! First we’ll drive through the dense jungle on our way to the Monkey Loop, named after the spider monkeys that can be spotted there when their favorite fruits are growing on the trees. No, not bananas! Our first stop is at an impressive cenote, crystal clear fresh water jungle pool where you’ll get the chance to wash off some the dust acquired on the ride over. We have snorkeling masks for you so you can check out the amazing stalactites underwater, that have formed millions of years ago. 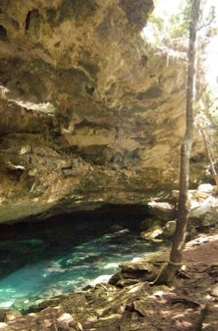 The path to the cenote runs right through the jungle so make sure you wear some comfortable shoes. Next we stop at the site of some ancient Mayan ruins. We can see various structures, some of them almost overgrown by jungle but you can still get a good look at some of the amazing architecture, built hundreds of years ago. The tour wouldn’t be complete without a visit to the truly spectacular dry caves. These caves have formed millions of years ago and are actually dry cenotes. They are filled with the most amazing decorations (stalagmites and stalactites) and are so large that you have the feeling you can keep walking underground forever. As we walk out of the cave you will see hundreds of sleeping bats hanging off the ceiling, Shh, don’t wake them up. After these stops we’ll head back to the reception where you can get a drink and buy yourself a souvenir ATV Explorer photograph. 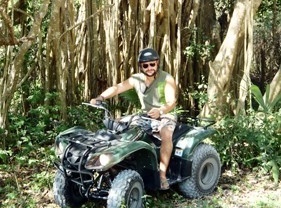 Price for the ATV Explorer tour does not include transportation. Transportation can be arranged from select resorts at an additional cost of $10 US per person.